Circa 1980s, 18k/platinum, Swiss. Set with dazzling garnets and brilliant white diamonds, these sublime paisley motif earrings are classic chic in the Mogul revival style. 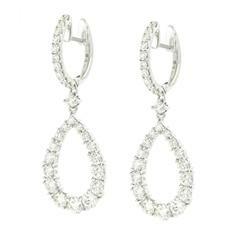 Meticulously made in Switzerland, they are part of a suite of jewelry that celebrates the lyrical style of Verdi’s operas. Excellent condition. Noted: Shown with matching pieces: Inv. No. 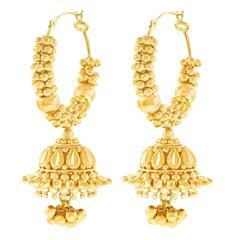 20998, 20999, 21000, 21002 Remark: “Classical Indian motifs have influenced western jewelry design for millennia. Just ask Cartier where most of their Deco inspiration sprang from!” SIZE: 1 1/4 inches high by 1 inch wide WEIGHT: 16.0 grams total STONES: 4.8 carats of Almandine Garnet and 1.15 carat total weight of G color, VS clarity diamonds HALLMARKS: 750 for 18k and maker's mark STOCK NUMBER: 21001 Jewelry acquired from this dealer must delight you. Purchases may be returned for any reason for a period of 7 days. Delightfully dainty and feminine, these sublime earrings are expertly crafted from radiant 18K yellow gold and depict lovely flowers. The earrings are set with eye-catching garnets.